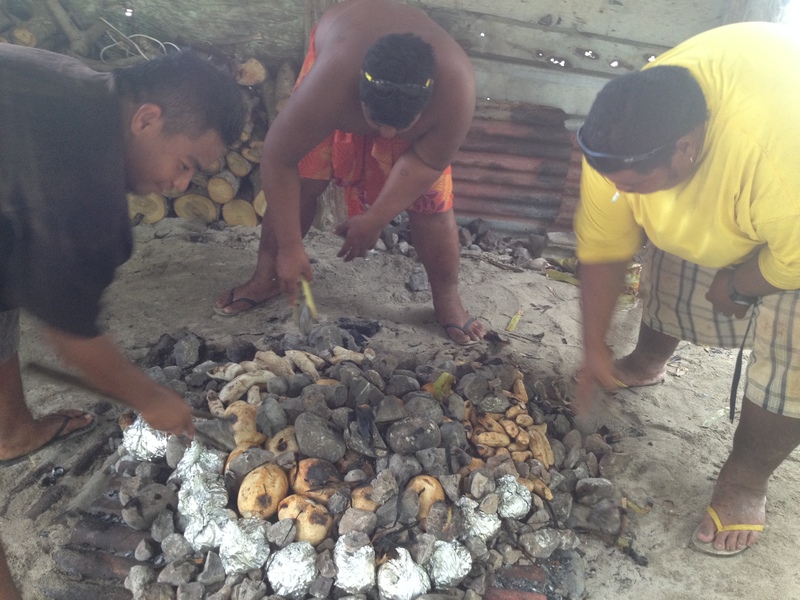 This article is dedicated to our Olosega Samoan friends, who graciously prepared the umu during daylight hours for our benefit. 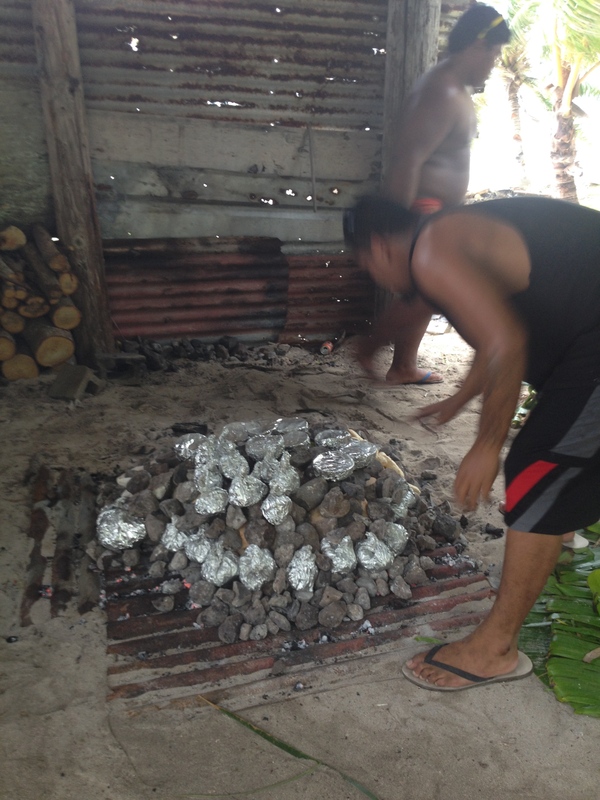 The umu is traditionally (at least by our friends) prepared in the wee hours of the morning and cooking is done by sunrise. 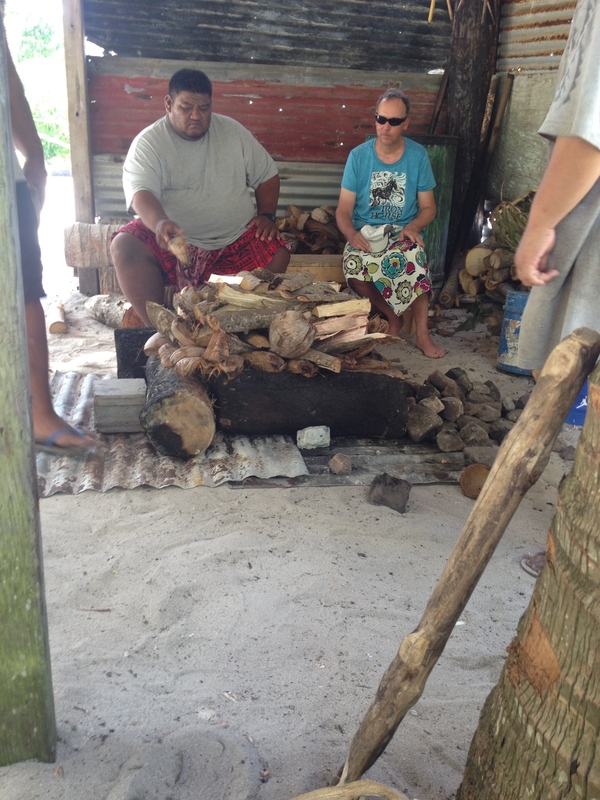 I think they recognized our lazy way of sleeping all night and started the umu after sunrise one day. When we noticed what was going on out our backdoor, we joined them and took many pictures and video of the process. This was amazingly simple, yet time consuming. Simple in that none of the dishes needed more than 3 ingredients. Time consuming because everything (except the mackerel and turkey tail) is prepared from the yard to the table. This is Part 1: preparation and use of the oven. The first step is to build the foundation for the rocks. Four palm logs are placed in a square and the hard wood (sorry, can’t remember which wood they use) is carefully laid inside. 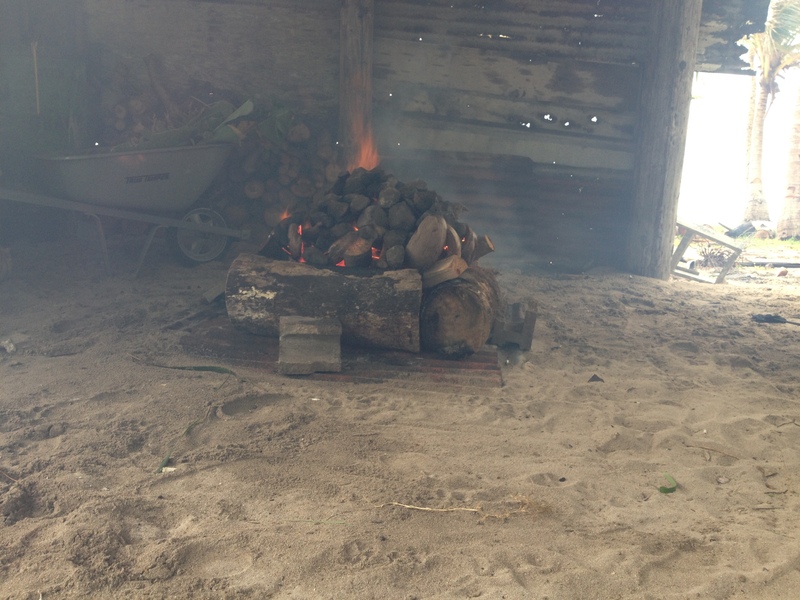 Rocks from the ocean are laid on top of the wood before the fire is lit. They leave an opening on one side to start the fire from the inside. 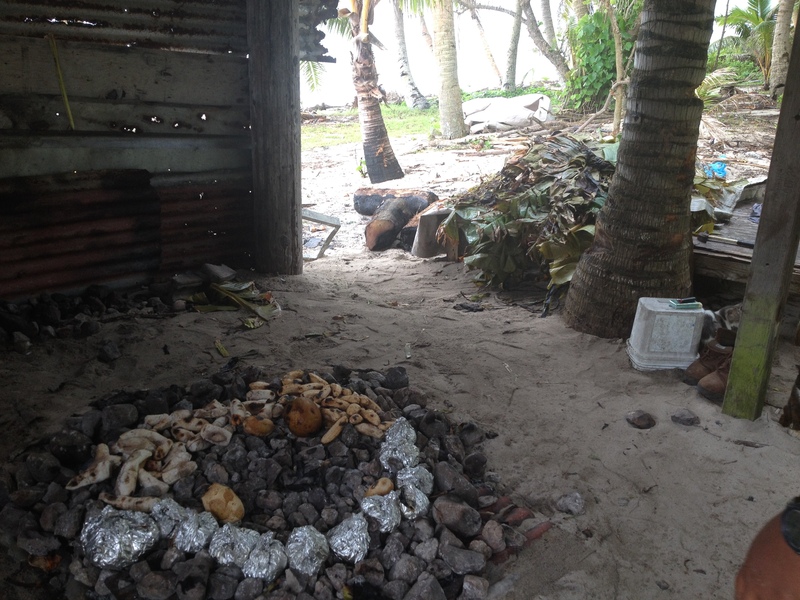 The coconut husks (from the many coconuts used for the meal) are laid on top of the stones as the fire burns. This heats the rocks from both underneath and on top. 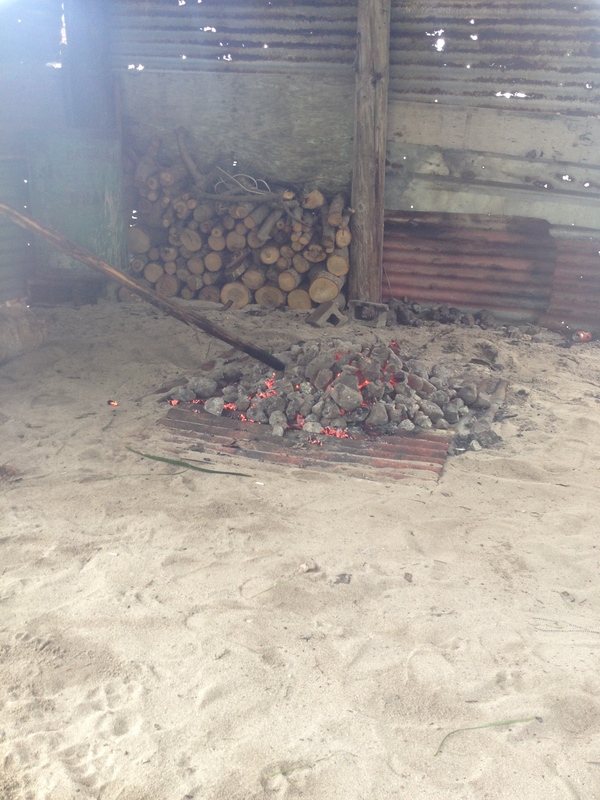 When the wood has burned down, the palm logs are removed (and thrown in the sand outside the umu). 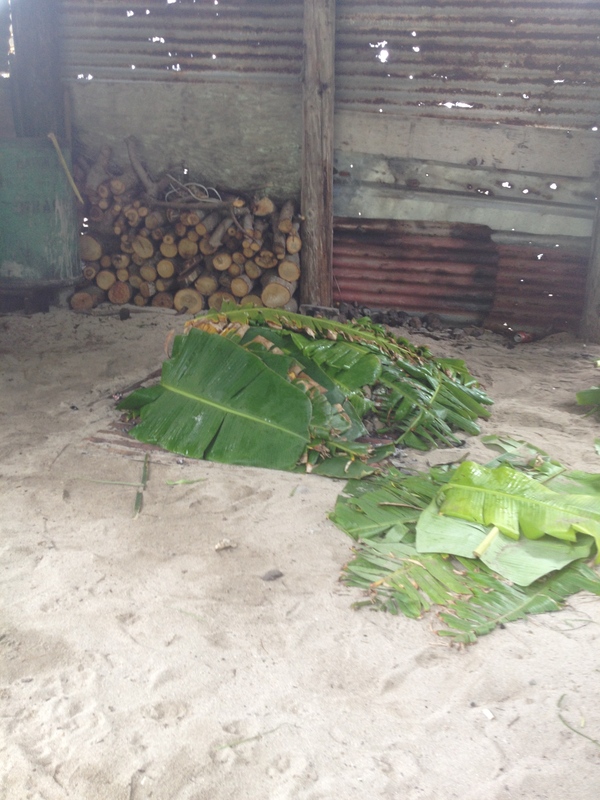 Palm leaves are used to sweep off the ash. Then the rocks are spread into a single layer using long sticks. The food is laid in layers on the hot stone. This is the first layer. Notice the baskets? 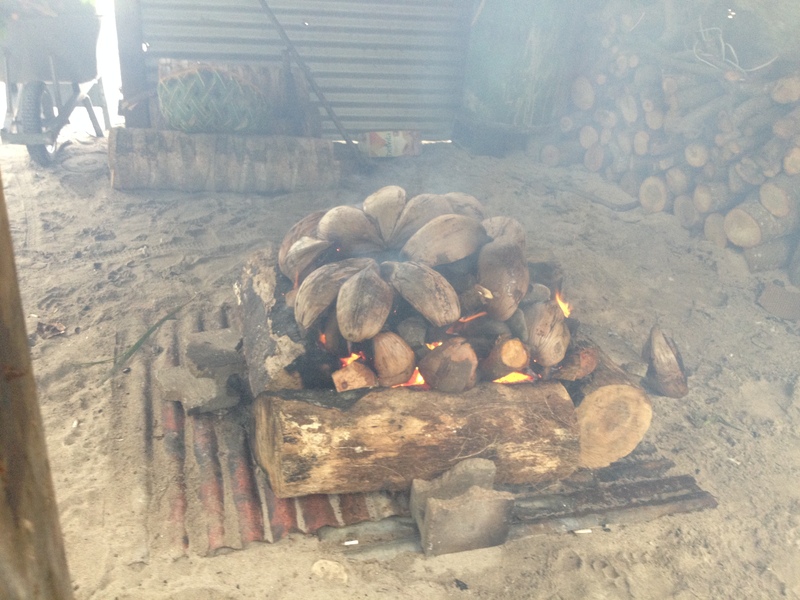 These are woven from coconut palm and used to store the food as it is prepared. They also use them to hold cooked food and later, trash. The food is placed in an orderly fashion. Probably so you know which foil bundles are which (see tomorrow’s post for more about the food). They use tongs made of folded leaf spines (really hard ones) to move the rocks. 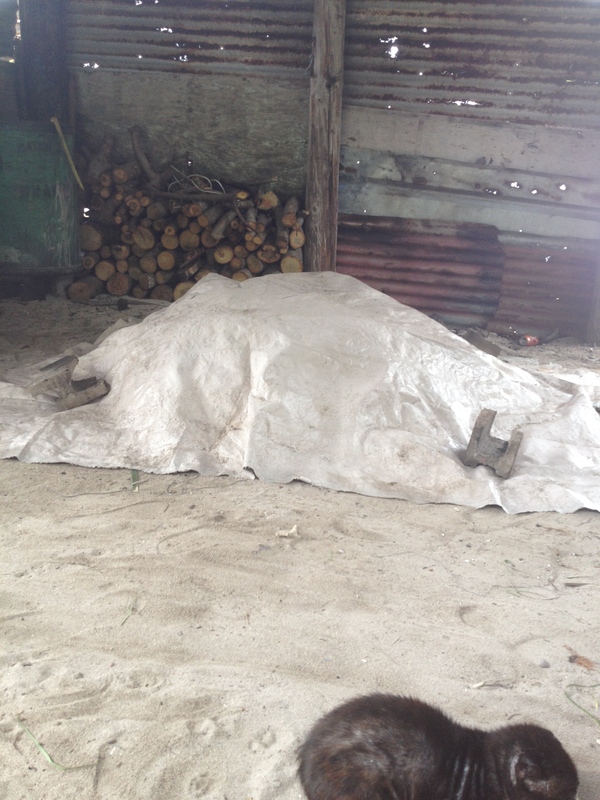 The tongs are hung from the rafters of the umu when not in use. 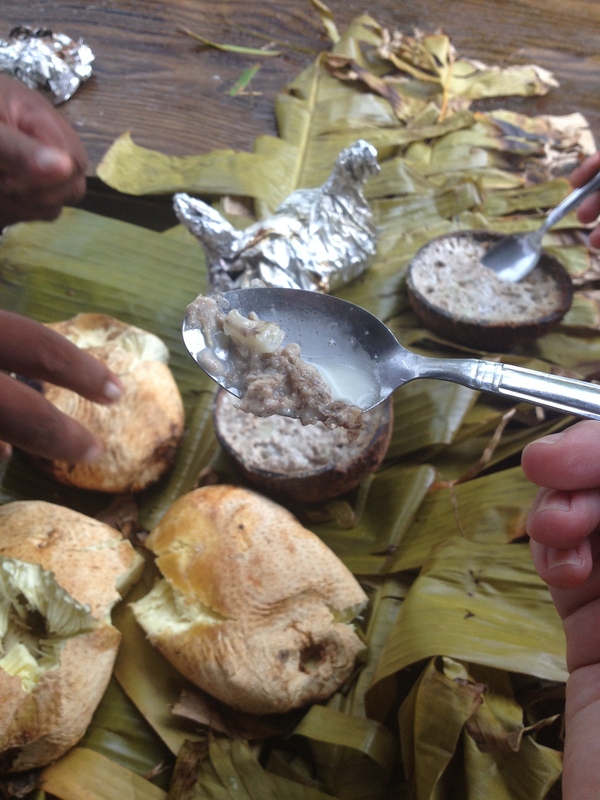 It takes a lot of banana leaves to cover the food and rocks. Lastly, the whole thing is covered by a tarp! I thought this was a slow cooking method. So when I asked Fetui how long it would take, expecting to be free for the remainder of the afternoon, I was very surprised to hear him say, “one hour”! 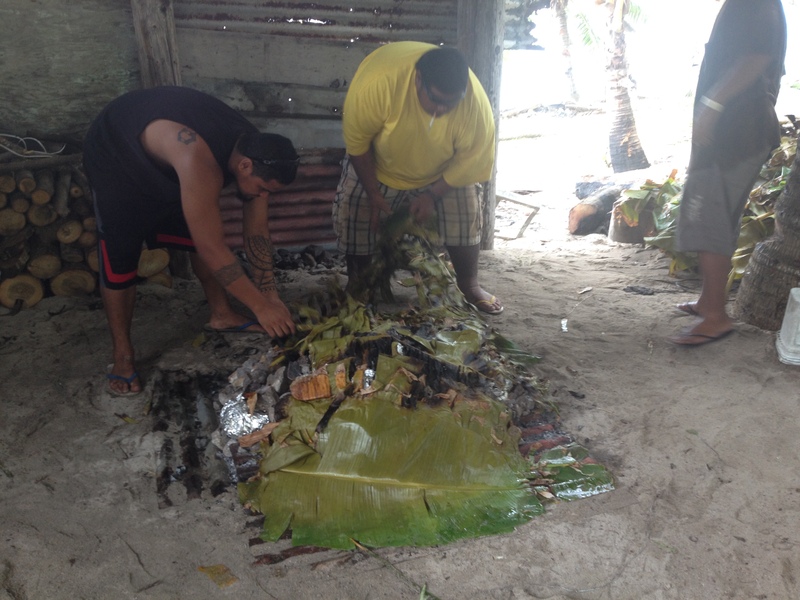 It was tricky getting pictures because once Fetui says it’s done, the men are very quickly pulling off the tarp and banana leaves! Here, they are using the tongs to take the rocks off of the food. Those are bananas, taros, bread fruit and bundles of palusami. 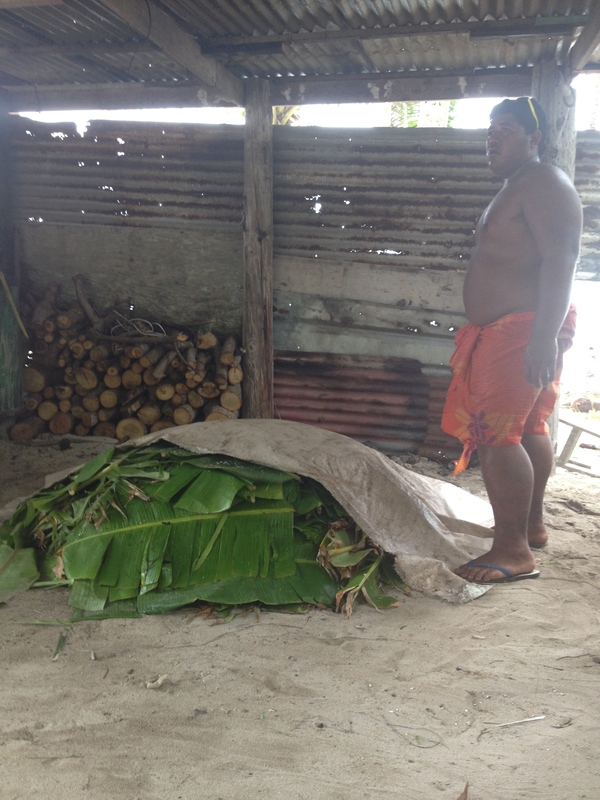 They laid out banana leaves to put our food on. And we ate, and ate, and ate!! 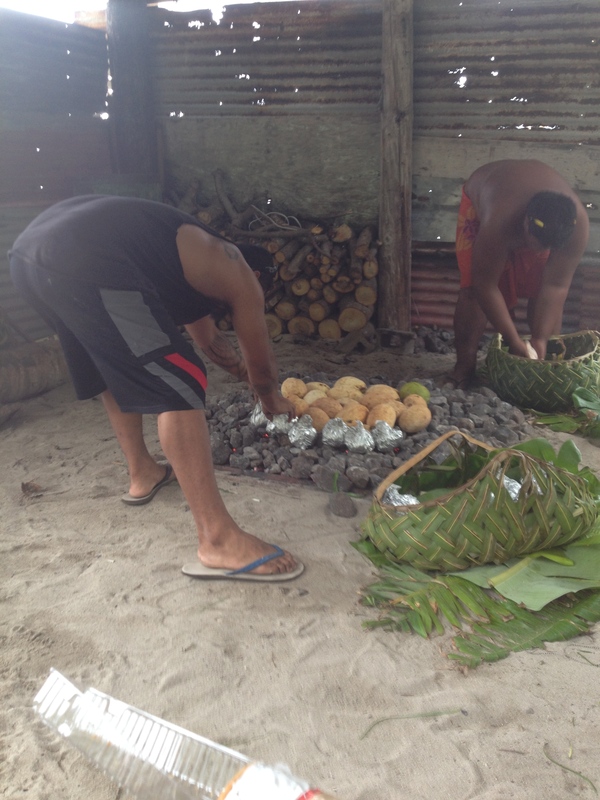 We feel very honored to have our Olosega friends prepare the umu for us several times while we visited. This feast is shared with many family and friends. And as I understand it, there is always a portion that goes to the pastor. There is more than enough for everyone! The breadfruit comes from the tree in the yard, the coconuts come from the yard, the banana comes from the neighborhood (if you don’t have one in the yard), and the tarot comes from the family plantation. The onions, turkey tail and mackerel are imported. But I’m sure they would use fish from the ocean if they needed to! The Samoans laugh hysterically when they watch “Survivor: Samoa” because they can’t believe anyone could go hungry on the islands because of the bounty of food! Tomorrow, I will describe the food! Stay tuned!